It charges my Nexus 4 without wires. Other than price, there isn't much to complain about. This is a great way to avoid wearing out the USB connection on the phone. Where else do you pick up a charger besides the Google Play store? With tax & shipping, they run about $70. I ordered Feb 11th, received shipping notification on the 14th and it arrived on the 15th. This charger is hot, or at least it makes your phone hot. Here is what I've seen so far - it is pretty "sticky", no problem keeping the phone on it with or without the bumper. My Nexus 4 will start to wirelessly charge about a 1/4" from the charger, so it should be OK even with a pretty thick case. Today my phone updated to 4.2.2 which according to the changelog shows that the phone will make a sound when it starts to charnge - and it does. I hooked it up to the Kill-a-watt meter, here is what I saw: 6-10 watts while charging with the screen on, 0 watts with the phone off the charger. Daydream - If you were wondering the Nexus 4 won't daydream on the wireless charger unless you set it to daydream while charging. I was curious to see if it would daydream with the option to do so while docked. The wireless charger doesn't count as a dock. I believe the specs when it says it will take 4 hours to charge, it seems pretty slow. I plan to use it on the nightstand, so it will work fine for me. So far so good. I'll be sure to post some updates once I've used this for a while. 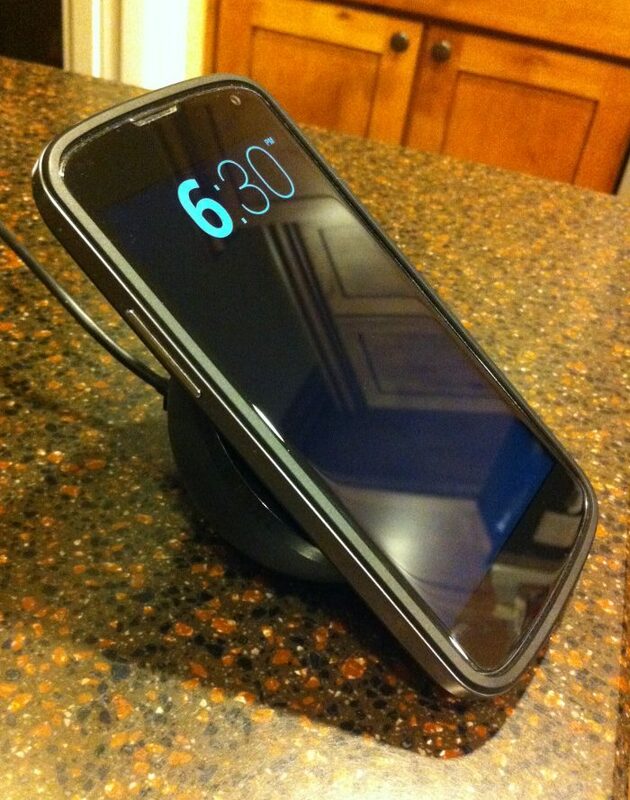 The wireless charger worked great last night. I did have to change my LED notifications so they are off while charging. I used to put my phone face-down on my nightstand, but with it on the charging orb, the LED was annoying me while I was trying to get to sleep. The magnets are strong, maybe a bit too strong. When I pick up the phone off of it, the orb almost comes with it. I tried to carefully lift the orb using only the phone and it comes close. I haven't had any issue slapping my Nexus 4 onto the charger, it isn't too picky about where it is - or I have really good luck. I don't know why it took me three days to try this, but you can charge the Nexus 4 in landscape orientation too. Upsidedown, sideways, whatever - it still charges. Since my charger is on a nightstand, I think the phone is easier to grab and repalce when it is rotated horizontal instead of vertical. The charge works great with a Ringke SLIM case on it. How would I know? I had to buy something to replace the piece of junk bumper that google sold. Mine only lasted a few months before cracking at the bottom, right near the USB connection - where the bumper is really thin. So far, I only have good things to say about the Ringke case. Last year I switched to a Nexus 5. My wife didn't want the slanted, hockey-puck charger so I kept it. It works great with the Nexus 5 too. We tried a charger off of Amazon.com for the Nexus 4. It was so bad it isn't in use. The charger from Google was spendy, but it works every time and has been going strong for almost two years.